Some things you may have at home or might usually throw away. 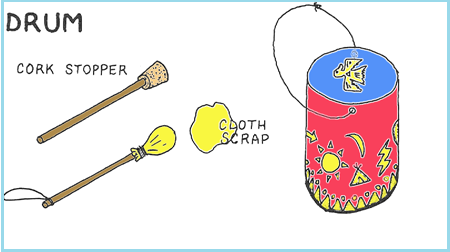 But you can make many interesting things with these throw away; and can recycle them to make great musical instruments that really work. After they're made, see what to do with them at bottom of page! Great Fun!!! Cut a piece of paper and fit it around a Can with a plastic lid; you can use a large Coffee Can as it will work well or you can use any size of it. You can also use an empty plastic jug or wooden bowl turned upside down or metal pot. 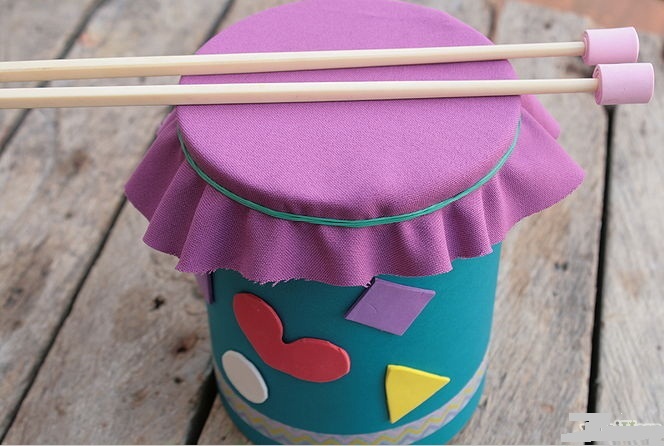 Once you fit the paper well you can decorate it using crayons & markers; or first you can make the paper look good with your designs and then fit it around the can using glue or a tape. Cut a paper in two pieces and fit it around two cardboard oatmeal containers with lids. 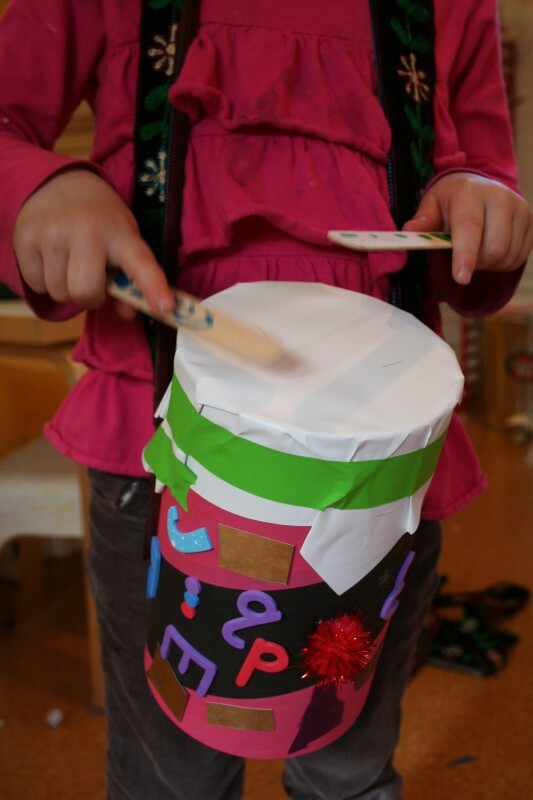 Now follow the same procedure to decorate the containers with a decorated paper or by making it unique with crayons and markers, and then attach the decorated paper around both containers with a tape or gum. Keep them aside to rest till the gum is all set and the containers are ready to use. Now, set the containers side by side and tie them together using two long pieces of string or yarn. You need to tie one piece of string around the upper section of the container and the other around the lower section; then place a dab of glue under the string in multiple spots to make it hold in place. 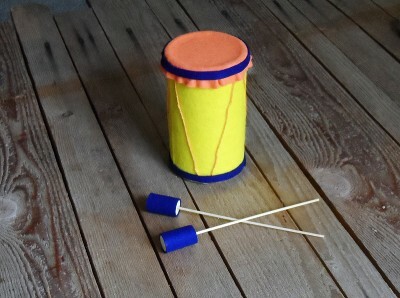 Now your Bongo drums are ready to play, Play your bongos by tapping on the tops with your fingertips. This is going to be a very easy task, you just need to turn a cooking pan over and beat on the bottom of it with a wooden spoon. Collect a round box, such as a potato chip or an oatmeal box container. Now carefully make two small slits, about 2 inches apart just near the top of the box; and thread the box onto a child's belt or a shortened adult belt. And that way your belt drum is ready. 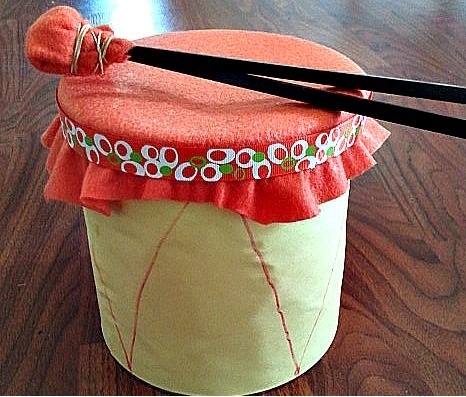 Once you are ready with your drums, it’s time for you to make drum sticks. 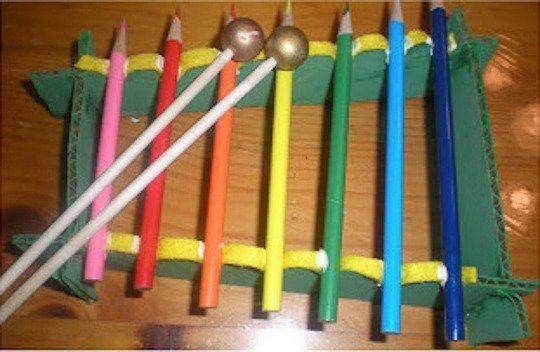 Let’s look at simple ideas on how to make drum sticks. The best thing is to use your hands to tap on the drums, or a wooden spoon, a metal spoon, rubber spatula, whisk or a basting brush. Take two unsharpened pencils with erasers and make drumsticks; or attach an empty thread spool on one end of the pencils and wrap a thick rubber band around one end of each pencil. Now it’s your turn to experiment with the variety of sounds and tones you can make. 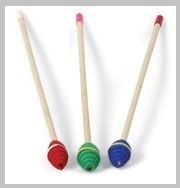 Gather your friends while doing this activity and make all your friends tap together two wooden dowels. You can also put metal thimbles on each finger and tap them together. Or you can also use two metal or wooden spoons, two walnut shells, or two metal pot lids to tap. Pancake flipper, metal grater, metal sifter or two pieces of sandpaper. Keys or set of metal measuring spoons, small set of wind chimes. Take a container of toothpicks, a container of nails or tacks or an envelope of flower seeds.